I am not a big Indiana Jones fan. But come on – who does not like running around in exotic terrains, knocking down the bad guys and being the hero. On second thoughts, maybe I do like Indiana Jones? My liking was not the driver that made me watch Indiana Jone and the Last Crusade. 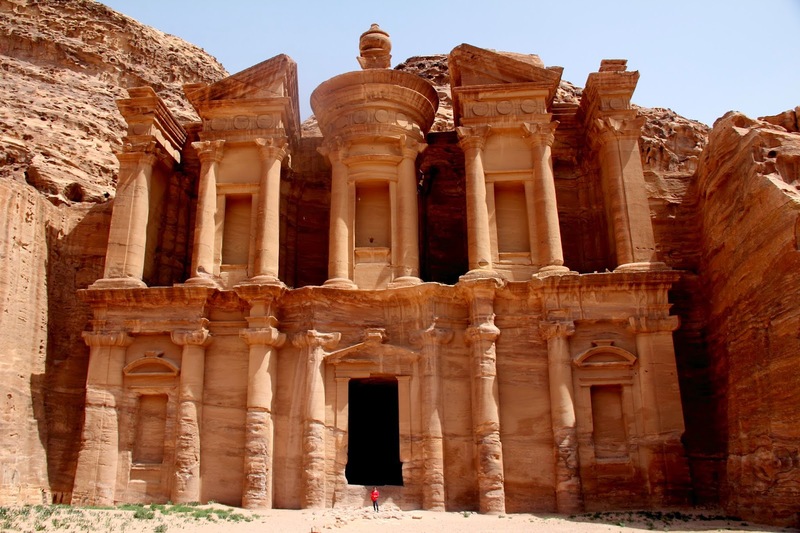 The driver was the upcoming trip to Petra – The Rose City. We were in Petra on a cool spring day. 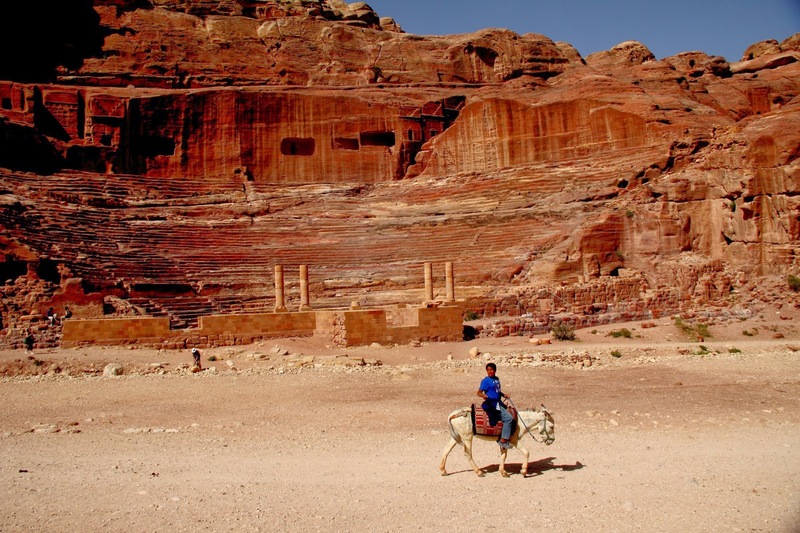 A bright morning was a good time to explore the ancient city of Petra. 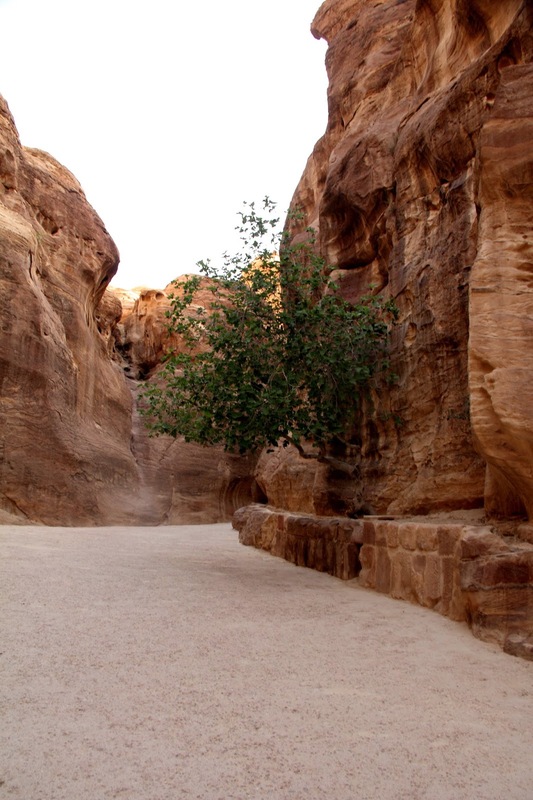 Perfect weather – we could not imagine walking through the rocky terrain in the sweltering Jordanian summer heat. Armed with two bottles of water, our camera and some Jordanian Dinar in cash, we were all set at the Petra entrance at 7:45 am. Our intention was to be there at 7 am. Have a heart, we were on vacation. Rising at 7 am was the best that we can do. A Trip to the Lost City Ain’t Cheap! It costs quite a bit for visiting the past – JD 50/USD 70 per person for the entrance ticket. Ouch! We have never spent that sort of money to enter any monument. There were no audio guides available. While my imagination is fairly livid, I did not think that I could do justice to the vastness that Petra offers by reading the text from the Lonely Planet (even though it is fairly descriptive- as always). Hence, we decided to use the services of a tour guide, again, an expensive proposition (JD 50 for a standard 4 hour tour). Had it not been for him, I would have opened the Lonely Planet, stood in front of every rock and stone and read it out to Ankur; thus extending a 4 hour trip by at least 2 hours! It was too early – we could not find fellow back packers to share the guide costs neither did we find any tour groups that we could trail. It was 7:45 am, and we had already spent JD 150 – can’t call it a budget holiday any longer! It was windy and dusty. There was a nip in the air. Three of us entered into the lost city of Petra. The first sights as we entered the ancient city were captivating simply because the rocks were so colourful. The Indiana Jones sound track played in my head on full volume – one needs to lock in all the senses to experience the place! And then, to ensure that we feel part of the action, a Bedouin on his handsome Arabic horse galloped by. 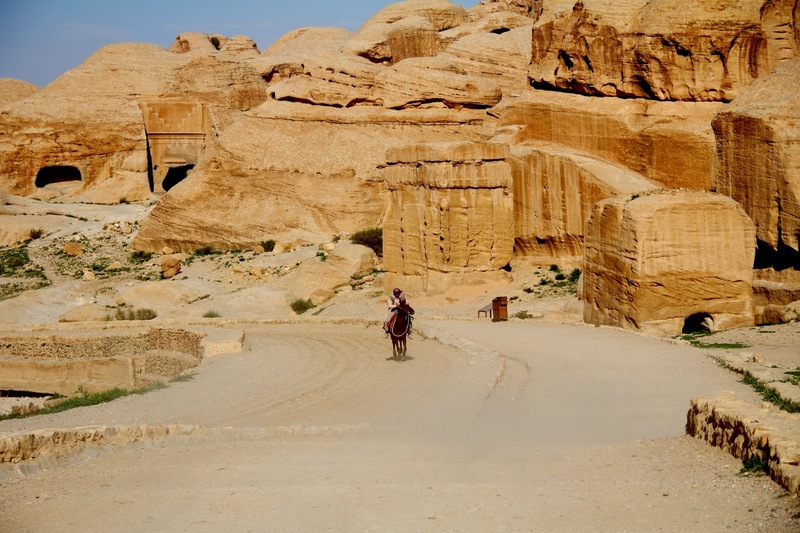 Welcome to Petra …to a realm that dates back to the 3rd century BC. 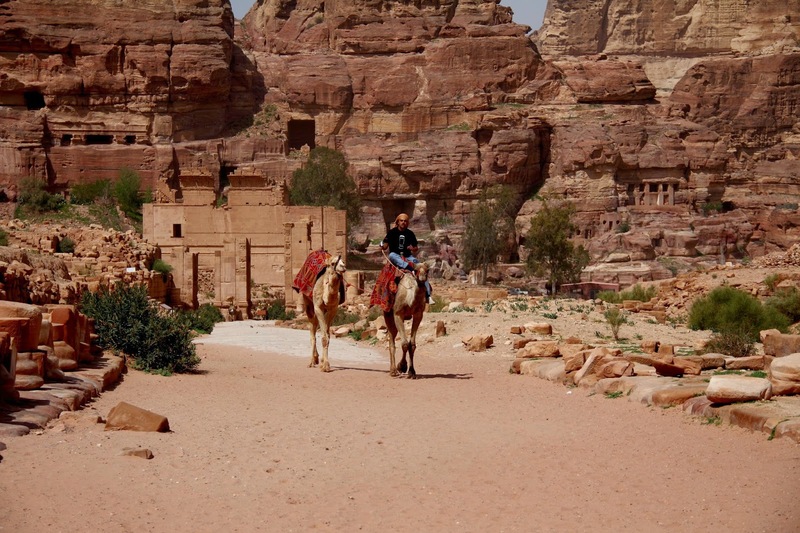 Petra: Local Bedouin galloping by! Its a fish… its an elephant… Oh! Its a rock! Our guide took us past a huge rock which looked like a fish from one angle and like an elephant from another angle – an interesting find. This rock is close to the entrance of the Siq and everyone wants to take a picture – the initial excitement! It was interesting to understand water supply and distribution system of the Nabateans. Back in 3 BC, they had water resources using water management techniques to ensure continuous flow pipeline that maintained a constant water supply throughout the year – in the rocky barren desert! 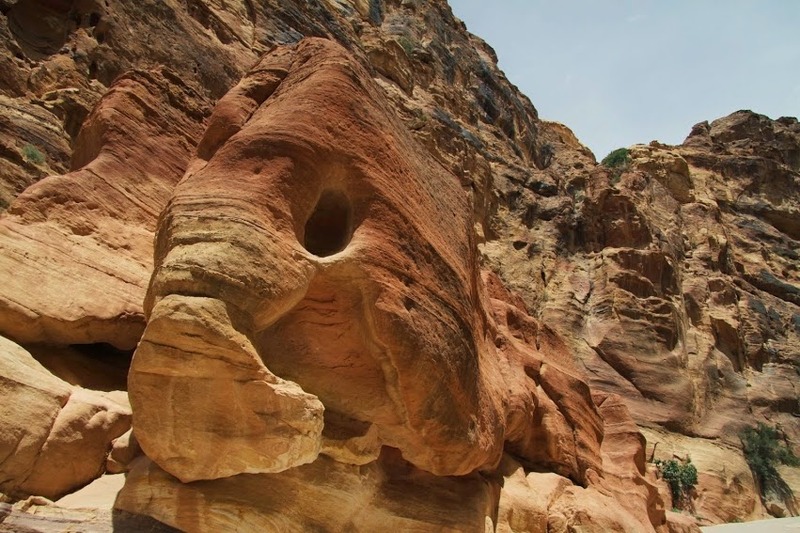 On the sides of the Siq, there were remains of the terracotta pipes – imagination with a little bit of science will tell you how smart the Nabateans were! Walking through the Siq was the best part of the journey. 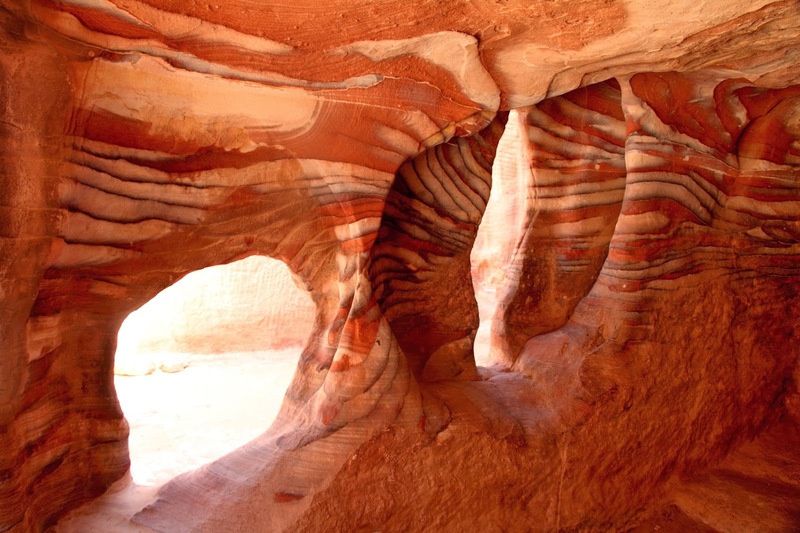 The red stone flaunted layers of colourful sediments, each dating back to a different era. We ran into a geologist, who works for Schlumberger. She was really excited about the geological structures as not only can you see the the varied, you can, in fact, determine which direction the river was flowing, which apparently, is a rare phenomenon. It was evident that certain parts of the Siq were the result of an earthquake – the opposite sides fit like a jigsaw, especially at the the narrowest part (about 2 meters apart). The donkeys walked by and carriages whizzed past us – I was taken back to the ancient times, imaging myself to be a silk trader from India, wondering what could I take back? 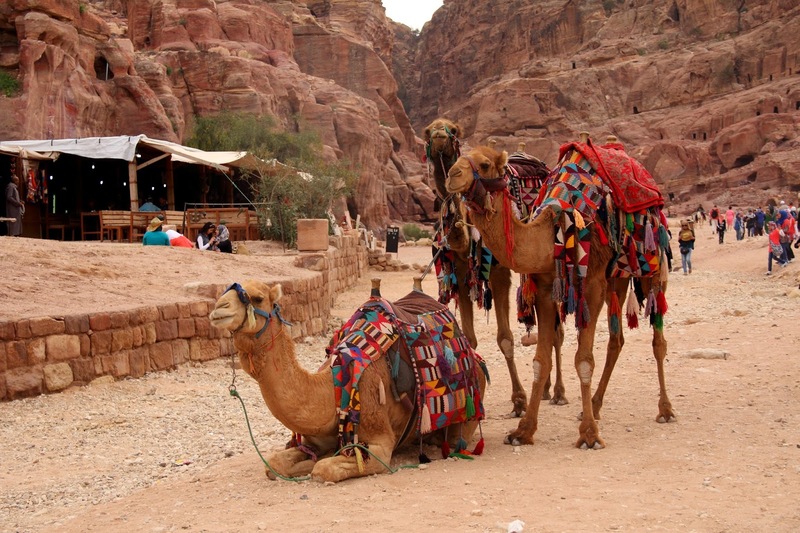 I would have walked miles with my camels and horses – it would have taken months to reach Jordan from India by a land route! As we moved through the Siq, we passed a carving of a camel, being led by a man. The rock was eroded and all that was left were repressions of the hoofs of the camel and man’s feet – the bond with the ship of the desert is long, and seems to have grown stronger ever since. Once we reached the Treasury, we realised that the camels have gained super model status and are prime subjects for every photographer who carries a camera and has walked through the Siq. 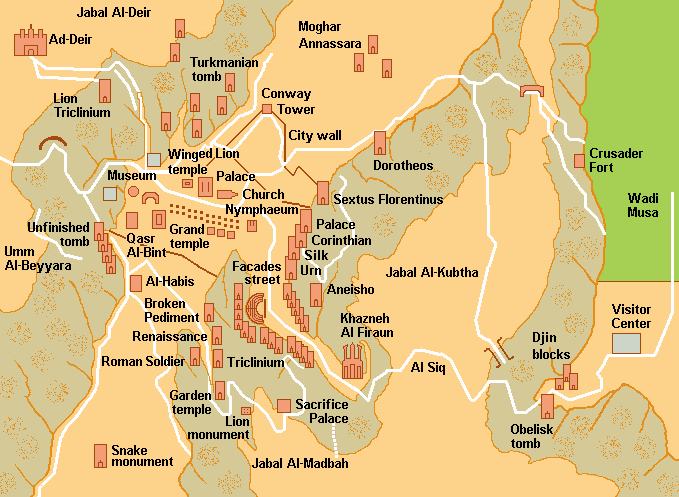 Al Khazneh: The Treasury – I am rich! Our guide was quite an interesting fellow – he dramatised our first glimpse of the Treasury. We walked with our heads down and eyes closed as he rattled the count down …and when we opened our eyes, we stood right before the majestic Treasury. Pictures can never do justice to the size and grandeur of the monument. Regardless of the number of pictures that you would have seen and the dozens of videos that you would have watched on YouTube – the Treasury will still amaze you. It made us seem small – tiny in size. At a time when there were no gantries and cranes, the construction of the monument is a remarkable feat.Reaching early had its advantages – we had the Treasury to ourself, and went a wee bit crazy clicking pictures. The Treasury was sunlit, which happens for only an hour in a day, and the pink stone reflected the sunrays back to the open sky. We were spell bound – we even stopped the Indiana act for a while – imagine that? The Treasury is actually a mausoleum of a royal dignitary – the dude surely did leave a mark that will stay on till eternity! It is over 40 meters in height and was carved into the rock face top down (so that the falling debris does not damage the monument). There weren’t too many people when we reached there and we went pretty crazy clicking pics …selfies …and more selfies with camels! Our guide recommended that we do the Al Dier trail ‘It’s easy – just 900 steps!’, he said. Jordanians have an interesting sense of humour, and this joke did humour us. He was insistent that we must do the trail and that it would be worth the effort. On all our previous trips, we have figured out that it makes much more sense to listen to the locals than follow guide books. The Al Dier trail it was! We walked through a theatre, and I think I managed to get a decent shot of the place – I am not being modest, am I? 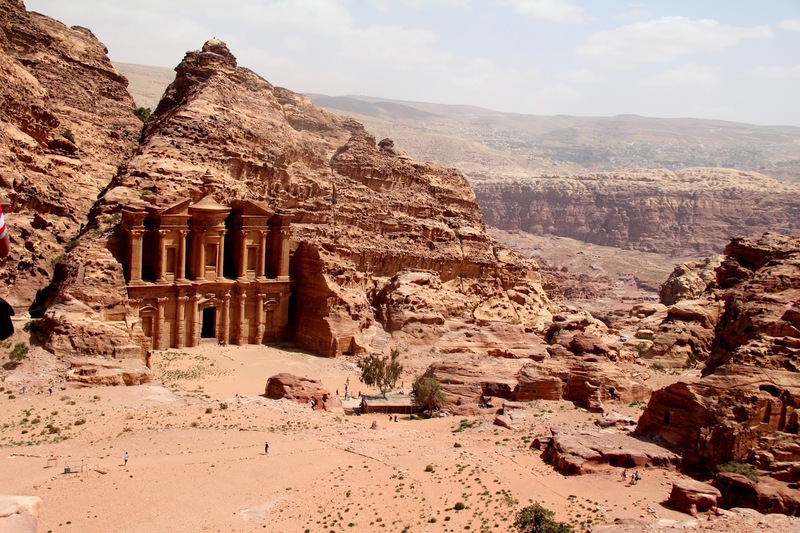 The Nabateans would host music and dance performances here to lure the traders into staying longer, trading more and paying higher taxes. We then walked through the colonnaded street which did make us feel a little like royalty. The columns had a Graeco – Roman feel to them – reminded me of our trip to Athens. We walked on the Al Dier trail and started climbing the steps. After every 10 minutes, I would turn around and reaffirm myself ‘ We are young and healthy – we will make it (without collapsing)!’. 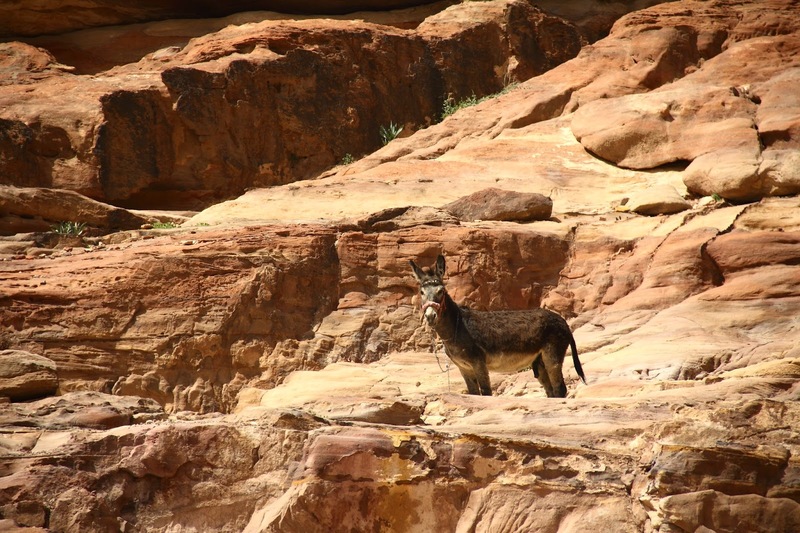 The views of the valley and the breeze let us sail through – the occasional donkey that posed and the bedouin women selling silver jewellery added the local flavours to our trip. The arduous trail to the Monastery curtails quite a bit of tourist flow and we did manage some quiet time under a tree. Apparently, a large part of the city is still be discovered – we stumbled upon a ‘foot’ carved out of stone and no one seemed to care about the artifact. It took us an hour to reach the Monastery – Al Dier, 45 meters tall, i even more grand the Al Khazneh. In fact, we liked it more than the Khazneh. There was a small restaurant facing the Al Dier, which was relatively quieter than the AL Khazneh area. We walked to a viewing point, about 20 meters from the Monastery – we could not agree more – Al Dier was a must do, as much as the Al Khazneh was! 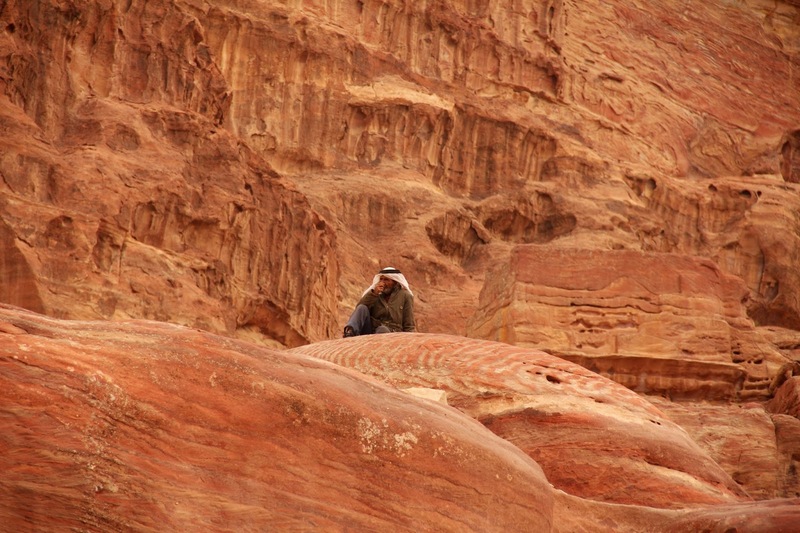 By the end of the day, we had spent over 8 hours at Petra and had walked over 25 km – it was time for a good lunch….followed by a long slumber! We had heard raving reviews of the ‘Petra by Night’ show from all our friends who had been there. The show is arranged thrice a week (check the Petra website for the exact days). 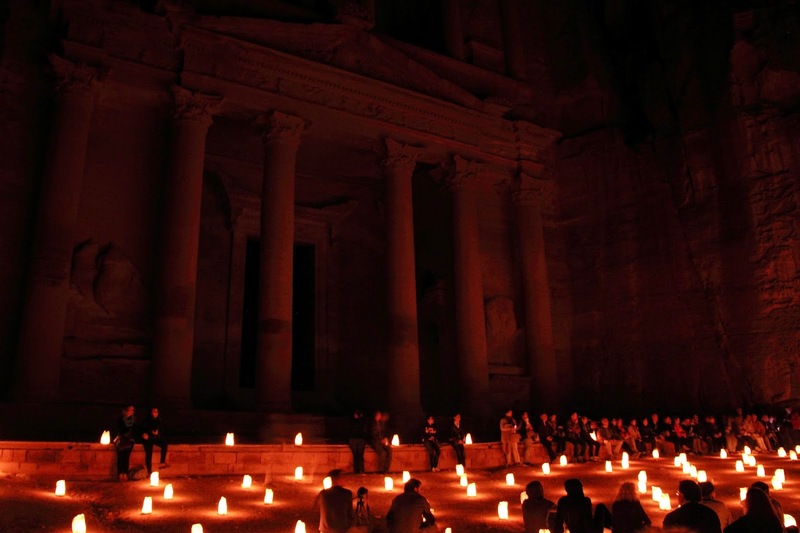 The entire Siq is lit up by candles. It is best that you walk behind the horde of tourists who want to be right in front. This will allow us some peace and quiet to experience the Siq in soft candle light (and keep the bright torch glow, which some tourists carry, out of your eyes). We walked through the Siq and reach the Treasury. The monument stood majestically, bathed in the glow of the dim candle lights. We were offered a cup of tea as a local Bedouin narrated a folklore, followed by some traditional music. We really didn’t think it was worth the money – costed JD 12 and we felt that we should have given it a miss. We are all intelligent in hind sight! By the end of the day, we had walked a total of 25 km – enough of calories burnt to down a few sinful Baklavas! 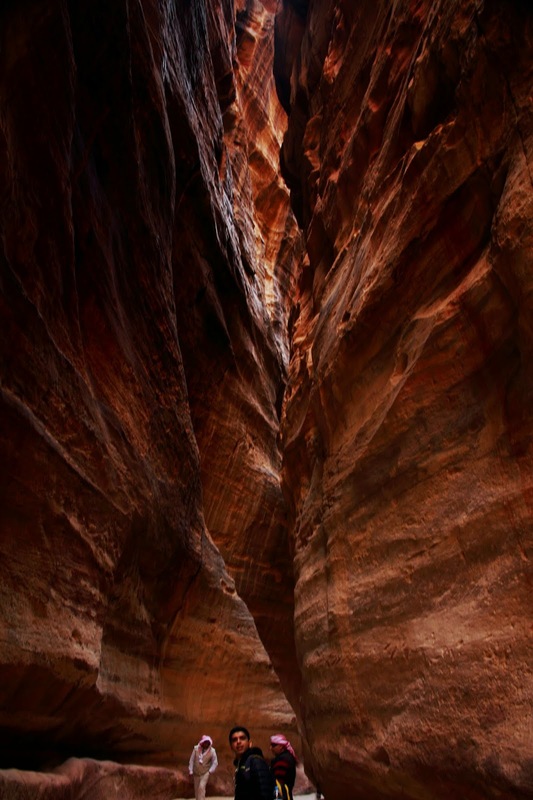 And thus ended our tryst with the Land of the Nabateans… the next adventure awaits us at Wadi Rum! Thanks Suman! Glad you liked the pics…More posts coming up ! 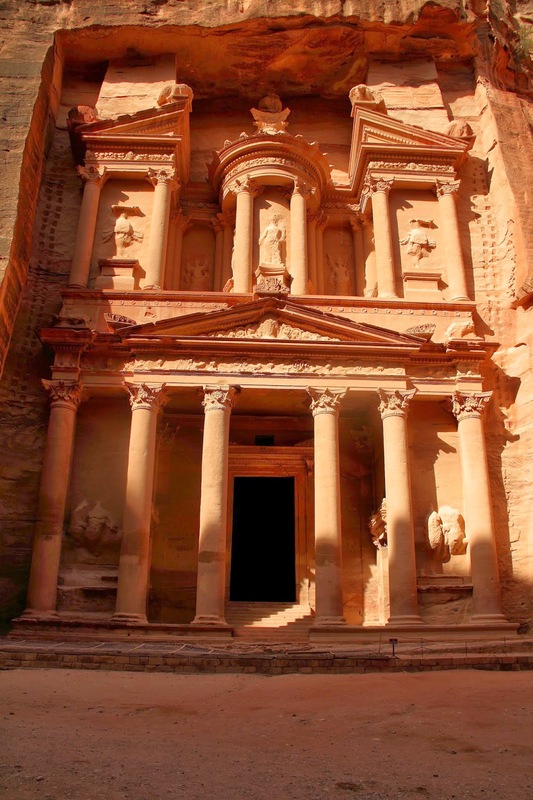 Petra is one of the places I would love to return to. Thanks for the lovely pics. Kalpanaa ..glad you liked them. My favourite place was the Monastery – liked it much more than the Treasury! Nice pictures..reminds me of my recent trip in March..loved the cave picture.